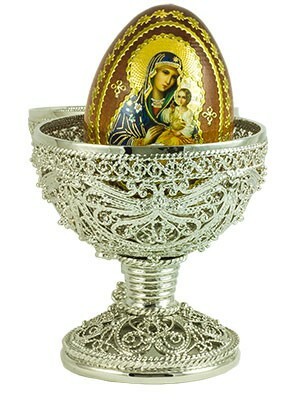 Duck Egg " Delicate Large " Cwith Wooden Egg Silver with Swarovski Cristals decorated by enamel, gilt and faux jewels. Hand Made with Swarovski Cristal. Truly Russian artwork, in traditional style of favorite jeweler of the Russian imperial Family. This Russian style trinket box is constructed from a pewter base. The box is hand enameled and decorated with Swarovski crystals. This box is hinged, and features a magnet for a clasp. The magnet enables the box to open easily, but close firmly. The box is great just for display, for holding or giving as a gift a small piece of jewelry, or for some of your memorable items.